How to protect children from heat. First of all, you can not allow for dehydration, so you should give them the right amount of fluids. You should also use specially designed for children creams with a UV filter, which will protect the child’s sensitive and especially vulnerable to sunlight. Check how you can protect your child against heat and prevent sun stroke. How to protect children from heat Overheating threatens heat stroke, and too long in the sun – heat stroke. It is difficult, after all hot summer days, to let the child out of the house. How to dress a child, what sunscreens to use and what to drink? So let’s know what water to give, eg 2-year-olds, and what kind of infants, and in what quantities. It’s best to quench your child’s thirst with mineral water, even when you do not want to drink. The healthiest is water with a low content of minerals, especially for children. A child aged 1-3 years needs about 1,300 ml of water a day, and a 7-year-old child about 2,000 ml a day. Infants should be given low-mineralized water (mineral content less than 500 mg / l). In turn, children aged 2 to 10 years can drink water, whose mineral components are in the range of 500 to 1500 mg / l.
You can also give baby teas and diluted fruit juices, but not very often, because they contain sugar, which binds water in the body, makes it difficult to excrete and cool the body. 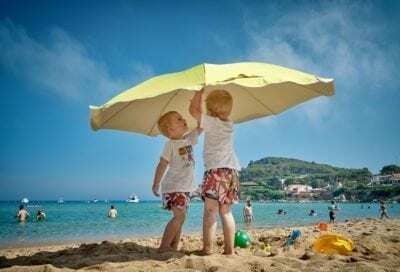 Children are very easily sunburned because their skin is thinner than the skin of adults and ultraviolet rays penetrate into its deeper layers. In addition, the sweat glands of young children are not yet fully functional, therefore they are unable to cool the body effectively. For a dozen or so even a few-minute stay on the intensely warming sun can end in painful skin burns. Therefore, during hot weather, avoid staying with the child in the sun between 11 and 15, when the sun’s radiation is the most intense. In addition, regular moisturize the child’s skin to protect it from drying. Smear the face and hands of the toddler 20-30 minutes before leaving the house cream with filter 50. For the rest of the body, apply a balm or lotion FOR CHILDREN (never for adults). If you spend the whole day outside with your child, on the beach, remember that the cream application should be repeated every 2 hours (this time the filter contained in it works, the cream rubs off the skin under the influence of sweat, sand) and always after leaving from water or wiping with a towel. In hot weather, pay special attention to hygiene, often take a baby bath and change the diaper so as not to expose the skin to soreness. For this purpose, it is best to use thermal water spray, preferably cooled earlier in the refrigerator. You can also apply a handkerchief to your child’s skin with cool water. The heat stroke is caused by excessive overheating of the body, mainly around the head. To prevent it, take care of the child’s headgear. At all times, also when he is in the shade, he should wear a handkerchief, a cap with a visor or a hat with a large brim that will also protect the neck from the sun. In hot weather, put your child in a thin material, preferably made of linen or cotton. These airy materials will effectively protect the child from the sun and overheating the body. If you are going with the child to the beach, dress them in a special bathing suit with a UV filter (you can buy them even for three-month-old children). A parasol and a special beach tent will also work on the beach. Infants up to 6 months of age should not be in the sun at all. However, if you decide to take a walk in hot weather, remember that the shadow is also exposed to the harmful effects of sunlight. If you are going for a walk with an infant or a small child in hot weather, sit them in a pushchair with an umbrella that gives more shade than the raised shack and allows greater air access. This way you will prevent heat stroke. In the hot weather, protecting your child’s eyes is equally important. Buy sunglasses with UV filters in a professional optical salon.